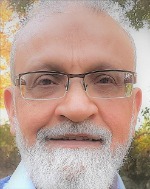 Dr Ata-ur Rehman completed his PhD at the King's College University of London, UK in 1991. The work included purification of two type of laccases (1&11) and cloning of laccase-1 gene from the root rot fungus Armillaria mellea . Dr Ata-ur Rehman is leading an ACIAR funded research project to improve the productivity and profitability of lentil, chickpea and ground crops in the existing cropping systems in Pakistan.The farmer-led project focuses on identifying agronomic factors limiting the productivity and profitability of lentils, chickpeas and groundnut, and evaluation of possible solutions; Increasing opportunities for farmers to undertake postharvest value addition to chickpea, lentil and groundnut crops, by adapting and demonstrating food processing technologies suitable for small holders to add value to crops where appropriate; and developing site-specific village-based seed production and seed dissemination systems to increase farmer access to improved varieties. K.Y., Zhao, J, Rehman, A.and Agboola, S (2012). In vitro antioxidant and bioactive properties of raw and roasted wattle (Acacia victoriae Bentham) seed extracts. International Journal of Food Science and Technology. 47, 9, 2000-2008. A.Rehman, R. Mailer, Belaj, A, de la Rosa R, Raman, H (2012). Microsatellite marker-based identification of mother plants for the reliable propagation of olive (Olea europaea L.) cultivars in Australia. Journal of Horticultural Science and Biotechnology 87 (6) 647-653. K.W.Jayasena, A-U. Rehman, R.J. Rose and J.W. Randles (2001). Resistance to Alfalfa mosaic virus AMV in transgenic barrel medic lines containing the virus coat protein gene. Australian Journal of Agricultural Research 52. 67-72. Miguel de Barros Lopes, Ata–ur-Rehman, Holger Gockowiak, Anthony J. Heinrich, Peter Langridge and Paul A. Henschke (2000). Fermentation properties of a wine yeast over-expressing the Saccharomyces cerevisiae glycerol 3-phosphate dehydrogenase gene (GPD2). Australian Journal of Grape and Wine Research 6, 208-215.